Royal jelly is food fit for a queen, the queen of a bee colony that is. 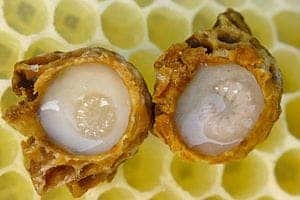 Honeybee larvae that are fed large amounts of royal jelly develop into queens. Royal jelly also has a second purpose—to keep the bee princess anchored to the top of the hive, where she develops, without falling down. Researchers from Martin Luther University Halle-Wittenberg found that small pH changes cause the royal jelly to change from solid to liquid. The study was published in Current Biology. “Royal jelly is kind of viscous and sticky and jelly-like; that’s why it’s called ‘jelly.’ It’s like a mixture of marmalade and honey,” says senior author Anja Buttstedt, a molecular ecologist who performed the study at Martin Luther University Halle-Wittenberg. Queen bee larvae developing in royal jelly. Image credits: Waugsberg. Royal jelly is so sticky that the queen uses it to hang from the ceiling of her regally named queen cell. Larvae that will become queens are larger than worker bee larvae and do not fit into honeycomb cells. Therefore, they usually only find space by hanging. What feeds the queen-to-be also lets her stay at her high vantage point (above her kingdom). Royal jelly usually has a pH level of 4. The researchers looked at the royal jelly under different pH levels and found that even at a pH of 5, the consistency changed drastically. At a neutral pH (about 7), it was no longer a jelly, but a liquid. Usually, proteins are purified at a neutral pH. In contrast, the German researchers purified these proteins at pH 4 — and they were massive, especially in comparison to the amino acid sequence. In lower pH environments, hence more acidic, the main protein in royal jelly, MRJP1, polymerized with another protein to form a network of fibers. The interaction made the protein larger and is what makes royal jelly, well, a jelly. There seems to be a good reason for this change, though it has not been proven yet. Worker bees produce royal jelly, so it needs to be fluid enough to pass through their glandular ducts and is kept at a neutral pH. The bees have another gland that produces fatty acids. When it meets the liquid jelly, it makes the pH more acidic so that it gets thicker. This likely occurs just before the jelly is secreted. Other organisms also regulate important proteins through pH levels. Even humans have this—a protein that serves as a scaffold for melanin synthesis only forms fibers at pH 6. Spider silk also needs to be liquid where it is produced, but strong when it comes out. “You don’t want it to be too sticky in the gland where it’s being produced, but when the silk is coming out, there are changes in pH that contribute to turning it into the real, strong silk,” Anja Buttstedt explains. Although it is common in other species, no one knew that a more neutral pH could make royal jelly a fluid. It makes sense when you think about it, but it is a completely new finding!